Context: Salivary control and maintenance of a dry operating field is a prime requisite of orthodontic bonding. Moisture insensitive primer (MIP) with a clinical significant bond strength values have a better edge over the conventional hydrophobic bonding systems. Aim: The aim of this study is to investigate the effectiveness of two hydrophilic primers with respect to conventional hydrophobic primer by comparing their shear bond strength (SBS) and adhesive-failure locations after contamination with saliva and saliva substitute. 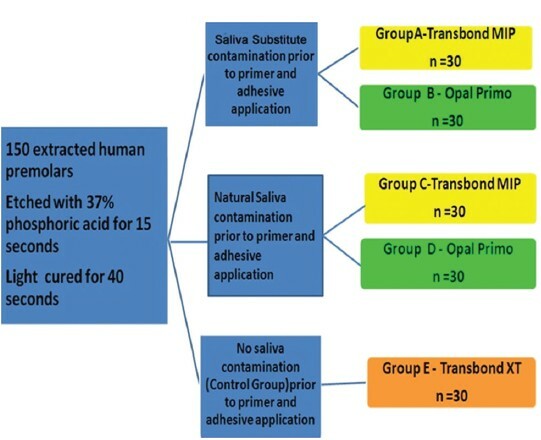 Materials and Methods: A total of 150 extracted human premolars were randomly divided into five group s ; Group A (Transbond MIP/saliva substitute), Group B (Opal Primo/saliva substitute), Group C (Transbond MIP/natural saliva), Group D (Opal Primo/natural saliva), control group - Group E (Transbond XT/dry), adhesive-Transbond XT used for all five groups and bonded using stainless steel brackets. Shear forces were applied to the samples with a universal testing machine. SBSs was measured in megapascals. The mode of bond failure was determined using the adhesive remnant index (ARI). Results: The mean SBS produced by Transbond MIP was higher than Opal Primo, which was statistically significant according to one-way analysis of variance. Both the tested groups showed lesser bond strength values than Transbond XT (the control). ARI scores revealed that there was no statistically significant difference in the site of bond failure between study groups. ARI scores were found to be lower for study groups suggesting adhesive failure, compared to higher ARI scores for the control group suggesting cohesive failure. Conclusion: Transbond XT adhesive with Transbond MIP or Opal Primo have clinically acceptable bond strength in wet fields. Opal Primo is a viable option to use as a hydrophilic primer clinically. Salivary control and maintenance of a dry operating field is a prime requisite of orthodontic bonding, because the most commonly used orthodontic primers and adhesives contain hydrophobic functional monomers (bis-GMA formula). Many devices such as saliva ejectors, salivary duct obstructers, antisialagogue tablets or injections are used in routine orthodontic practice. However, they are not adequate for moisture control in certain clinical situations such as bonding to surgically exposed impacted teeth, , teeth with primary or secondary eruption failure, partially erupted teeth, lingual bonding of brackets or retainers, bonding molar tubes or buttons on second or third molars, etc., Contamination can occur at two critical times: (1) After the tooth surface has been etched. (2) After the primer has been applied. Bonding could be compromised in both these situations. A reduction in bond strength of composite resins to etched enamel after moisture and saliva contamination has been reported by several authors. ,,,,, An area for clinical improvement is the tolerance to moisture contamination during bonding to reduce the incidence of bond failures. Moisture insensitive primers (MIP) and hydrophilic resin systems that have been recently introduced claim to provide comparable bond strength in a wet environment. ,,, They overcome the disadvantages of reduced bond strength of hydrophilic resin-modified glass-ionomer cements, and other hydrophobic conventional primers. ,,, The most commonly used MIP is Transbond MIP (3M Unitek, Monorovia, California, USA). Crane et al. have reported that moisture contamination did not decrease the shear bond strength (SBS) of GC Fuji ORTHO L.C (GC Corporation, Tokyo, Japan) or Transbond XT (3M Unitek, Monorovia, California, USA) with MIP when bonded to etched enamel. Hara et al. have reported clinically acceptable bond strengths under dry conditions for hydrophilic adhesive systems. However, Littlewood et al. found significantly lower bond strength with new hydrophilic primer in a dry environment. Rix et al. and Grandhi et al.,  showed that MIP with their respective adhesives are effective in both wet and dry fields. Another recently introduced primer Opal Primo (Opal Ultradent product, Texas, USA) is marketed as a hydrophilic drying agent. It has been claimed that its drying agent seeks out the moisture, evaporates it from the bonding field and draws resin in. Opal Primo contains a proprietary synthesized monomer that improves the strength of any light cure adhesive. With its unique, replaceable tips, it can be economically applied in a thin layer, minimizing time, and wastage. There are no recent studies comparing the SBS of Transbond MIP and Opal Primo hydrophilic resin primer along with conventional Transbond XT primer as control. Therefore, the purpose of this study was to investigate the effectiveness of MIPs (Transbond MIP and Opal Primo hydrophilic primer used along with Transbond XT adhesive) with respect to conventional hydrophobic primer (Transbond XT) by comparing their SBS and adhesive-failure locations after contamination with two different conditioning agents, namely, natural saliva and saliva substitute: Wet mouth (ICPL health products Ltd., India). The null hypothesis was that there was no difference in SBS between the two hydrophilic primers. A total of 150 extracted sound human adolescent upper first premolars were collected and stored in distilled water. Less than 6 months had elapsed between their extraction and the bonding experiment. Teeth with restorations, enamel defects or abnormal cracking were excluded. The criteria included an intact buccal enamel surface with no cracks caused by pressure of the extraction forceps, no evidence of caries, no developmental defects, no restorations, and not treated with chemical agents (such as hydrogen peroxide). A total of 150 teeth were randomly assigned to five groups with 30 teeth/group. The adhesive used was Transbond XT for all five groups. Each tooth was mounted on acrylic stubs with the roots embedded in a fast setting self-cure polymethyl-methacrylate resin and was given individual color coding. The teeth were oriented such as to ensure that the height of contour of the buccal surfaces were perpendicular to the adhesive and bracket base. The teeth were cleaned with nonfluoridated pumice and a rubber cup. The enamel surface of the teeth were etched with 37% phosphoric acid for 15 s, and then rinsed with a water spray for 10 s and gently air dried. A thin coat of saliva was applied with a brush to the etched and dried enamel surface of Groups A-D just before the application of primer. The excess was blotted out, leaving the surface moist. Wet mouth (ICPL health products Ltd., India) solution comprises of sodium carboxy-methyl cellulose 0.5% w/v and glycerine in a pleasantly flavored base 30.0% w/v. Unstimulated fresh natural saliva was collected from the operator within an hour after brushing, without any food consumed in-between. Stainless steel upper premolar brackets (MBT 0.22 slot, Diamond, Miniseries 2000 Ormco, USA) were bonded to the teeth with different materials as mentioned above. The specimens were divided according to the method of moisture contamination and primer-adhesive application [Figure 1]. The primers and adhesives were light cured with 3M Unitek halogen curing light for 40 s; 20 s proximally, 10 s occlusally and 10 s gingivally. All the bonding procedures were carried out by the same operator. After bonding, all the samples were stored in distilled water in a sealed container at room temperature for 48 h. The specimens were placed in a mounting jig in the Lloyd's universal testing machine in such a way that the bracket base was parallel to the shear load [Figure 2] To ensure that all the brackets were mounted in the same orientation relative to the acrylic cylinder, the teeth were suspended from a stainless steel wire (0.019 × 0.025 inch). 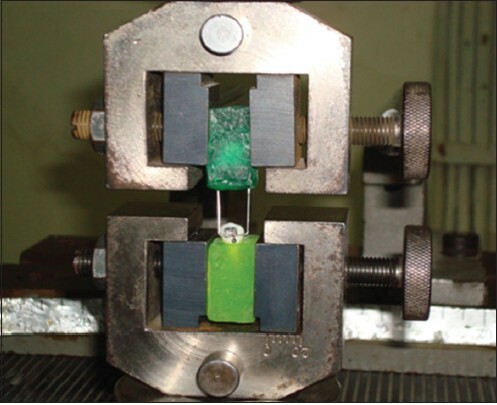 This mounting procedure ensured consistency for the point of force application and the direction of the debonding force. A shear debonding force was applied to the bracket base in the occlusogingival direction at a crosshead speed of 1 mm/min. The maximum force necessary to debond or initiate bracket fracture was recorded in megapascals (MPa). Debonded specimens were randomly examined at ×10 magnification to evaluate the site of bond failure and the amount of adhesive remaining on the tooth by using the adhesive remnant index (ARI) as described by Εrtun and Bergland. According to the index four scores were described - (0) indicates no adhesive residue on the tooth in the bonding area, (1) <½ of adhesive residue remaining on the tooth in the bonding area, (2) more than ΍ of adhesive remaining on the tooth in the bonding area, (3) all the adhesive remaining on the tooth in the bonding area. After obtaining the results, data were collected and entered into Microsoft Excel sheet, MS windows 2010 version [Microsoft, Redmond, WA, USA]. Data analysis was performed using Statistical Package for Social Sciences Version 17 [SPSS Inc, Chicago, IL, USA]. Descriptive statistics were done for the bond strength and ARI scores based on the various groups. One-way analysis of variance (ANOVA) was used to find out whether their existed a statistically significant difference between the mean bond strength scores based on the various groups. Adhesive remnant index scores were assigned by the same observer at two different times and before subjecting them for analysis, intra-observation reliability was tested using kappa-statistic. For the ARI scores, median was used to represent the central tendency and compared between the groups using Kruskall-Wallis ANOVA followed by Mann-Whitney U-test as post-hoc analysis. For all statistical analysis alpha error was set at 0.05. The mean SBS values of different materials under different conditions and their comparison with the control group is shown in [Table 1] and [Figure 3]. ANOVA showed a statistically significant difference among groups (P = 0.007). Transbond MIP showed significantly higher bond strength as compared with Opal Primo group for both conditioning agents (natural saliva and saliva substitute). The mean bond strength of the control Group E (11.46 MPa) was significantly higher than Opal Primo groups (under saliva substitute - Group B and natural saliva - Group D). 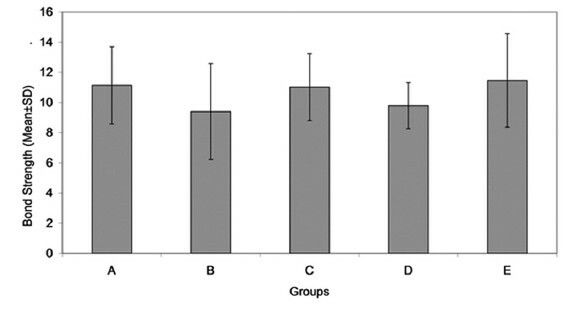 Mean bond strengths of Transbond MIP groups (under saliva substitute - Group A and natural saliva - Group C) did not show a significant difference from the control group. No intra-observer variability in ARI scores [Table 2] and [Table 3] was found. For ARI scores, according to the Kruskall-Wallis ANOVA exhibited statistically significant difference between groups (P < 0.05) and based on Post-hoc analysis for pairwise comparison using Mann-Whitney U-test showed a statistically significant difference between (1) Group E and Groups A, C, and D. (2) Groups B and C.
According to the manufacturer, Opal Primo is an orthodontic light cure bonding enhancer (resin primer). It contains a hydrophilic drying and wetting agent. The drying agent seeks out moisture, evaporates it from the bonding field and draws the resin in, ensuring reliable, consistent bonding. It contains ethyl alcohol solvent (drying agent) and 7.5% radiopaque nanofillers to retard evaporation and penetrate even the tiniest fissures, creating the most secure bond. Opal Primo contains a proprietary synthesized monomer that improves the strength of any light cure adhesive. With its unique syringe and replaceable delivery tip, Opal Primo can be economically applied in a thin layer, evenly coating etched surfaces offers precision and accuracy while minimizing application time and wastage. Both hydrophilic primers (Groups A and C - Transbond MIP and Groups B and D - Opal Primo) that were used are ethanol based primers. Ethanol has the property to diffuse and is easily miscible in water. Therefore, it demonstrates higher bond strength when used on contaminated wet enamel surfaces compared to that of acetone based primers. Acetone based primers (control Group E - Transbond XT) do not easily get diffused in water as far as enamel bonding is concerned and thus produce lesser bond strength when compared with ethanol based primers under moist condition. Clinically, acceptable bond strengths have been reported to a range from 5 Mpa to 8 Mpa. These bond strength are considered to be able to withstand various tensile loads. However, the clinical acceptable SBS for orthodontic brackets to enamel is still unknown. There is a wide variation in the bond strength values in the literature. Previous studies using Transbond MIP primer with Transbond XT resin adhesive have reported bond strengths ranging from 10.4 Mpa to 20 Mpa. ,, The mean bond strength obtained in this study was well above the clinically acceptable bond strength values indicating the use of these hydrophilic bonding materials in contaminated environments. Many studies have been done to assess the effectiveness of Transbond MIP; Grandhi et al. found statistically significant higher bond strength for Transbond MIP than Transbond XT primer in wet etched condition using bovine teeth and fresh saliva. Oesterle et al. found bond strengths to bovine enamel to be 21-44% weaker than to human enamel. Littlewood et al. have reported lower bond strength with the fifth-generation MIP primer (6.43 Mpa) compared with a conventional primer (8.71 Mpa) in dry conditions using APC brackets bonded on human premolars. The presence of water may have improved bond strength of hydrophilic primer and can be further supported by the findings that some dentin bonding agents are shown to be more effective in the presence of water. Schaneveldt et al. showed higher bond strength for both the conventional Transbond XT primer (14.82 ± 2.62 Mpa) in dry-etched conditions and Transbond MIP primers (12.23 ± 2.53 Mpa) in wet etched condition than the bond strength values obtained in this study. They followed the surface treatment sequence of etch, rinse/dry, saliva, primer, composite, visible light cure collectively known as "prepriming". Some of the sample groups in their study were primed with MIP first, then a thin coat of natural saliva and another thin coat of MIP was applied over this wet surface, and then cured with adhesive. This sequence was known as "intrapriming". They showed higher bond strength values for "intra priming" group (14.02 ± 2.94 Mpa) in comparison to the prepriming group. Webster et al. showed a mean bond strength of Transbond XT with MIP is 20.72 ± 4.61 Mpa after surface treatment sequence of etch, rinse/dry, artificial saliva, primer, composite, visible light cure of bovine teeth. Faltermeier et al. evaluated the SBS of a conventional primer (Transbond XT) and a MIP (Transbond MIP) under dry conditions/after contamination with natural saliva, blood, remnants of etchant gel. Thermocycling in a mastication device was done to simulate the oral cavity. Under dry conditions, Transbond XT and Transbond MIP showed no significant difference in SBS. However, clinically unacceptable bond strength was observed using Transbond XT after saliva, blood and etching gel contamination. In wet conditions, only Transbond MIP showed sufficient bond strength in all three groups. All the bond strength values in the study are lesser than the bond strength values of Transbond XT and Transbond MIP in this study. This might be due to the thermocycling procedure done in the study, which may be an additional insult affecting the bond strength values. Deprα et al. evaluated the influence of saliva contamination on the bond strength of metallic brackets bonded with hydrophobic and hydrophilic composite resin system. The results of the study concluded that the SBS of hydrophilic group was not affected when compared with hydrophobic group (Transbond XT Primer + Transbond XT) supporting this study. Cunha et al. assessed the impact of blood contamination on SBS of new hydrophilic resin. It was concluded that there was a significant decrease in the SBS of both hydrophobic system (Transbond XT Primer + adhesive) and hydrophilic system (Transbond self-etching primer + Transbond plus color change adhesive). But hydrophilic resin group showed higher bond strength than hydrophobic resin adhesive group supporting the present study. Santos et al. evaluated the SBS of hydrophilic (Transbond plus color change/Transbond self-etching primer) and hydrophobic (Transbond XT/XT Primer) bonding systems (in vitro) after contamination of the enamel surface with water, saliva, and blood. It was concluded that the contamination with blood resulted in the lowest SBS for both bonding systems. Hydrophilic group showed higher SBS than hydrophobic group under all conditions except the dry enamel surface supporting this study. Sfondrini et al. assessed the effect of water and saliva contamination on the SBS and failure site of orthodontic brackets and lingual buttons by bonding to bovine permanent mandibular incisors. Ortho-solo primer and Transbond XT adhesive were used for bonding. It was concluded that water and saliva contamination of enamel during bonding procedures lowers the bond strength values more with orthodontic brackets than disinclusion buttons supporting this study. Nirupama et al. evaluated the SBS of hydrophilic bonding materials such as Transbond MIP/assure, Enhance LC, Prime, and Bond NT after contamination with artificial saliva. It was concluded that (1) noncontaminated surfaces had the highest bond strength for both hydrophilic and hydrophobic materials. (2) Different hydrophilic bonding systems showed improved bond strength with reapplication of primer after saliva contamination supporting this study. The limitation of this study is that being an in vitro study, further extensive clinical trials over an extended period are needed to evaluate the performance of this material in a clinical situation. Adhesive remnant index scores - Lower ARI scores suggesting more frequent failure between adhesive and enamel for Transbond MIP and Opal Primo groups compared with higher ARI score for Transbond XT (control group) was observed. The tooth cleanup procedure after debonding was easier and faster for Transbond MIP and Opal Primo groups than Transbond XT-control group. The authors wish to thank Dr. Shakeel Ahmed, Dr. Madan Kumar and Dr. Biju Tom for their significant help in drafting this article. They also thank Mr. Varun Arora, Active research group, Lucknow, India, for his statistical assistance, Mr. Ashok for his technical assistance and Mr. Rajendran for the photographs. 1. Cobo JM, Moro JM. Hydrophilic adhesive for bonding to impacted canines. J Clin Orthod 1994;28:600. 3. Fritz UB, Finger WJ, Stean H. Salivary contamination during bonding procedures with a one-bottle adhesive system. Quintessence Int 1998;29:567-72. 4. Powers JM, Finger WJ, Xie J. Bonding of composite resin to contaminated human enamel and dentin. J Prosthodont 1995;4:28-32. 5. Itoh T, Fukushima T, Inoue Y, Arita S, Miyazaki K. Effect of water, saliva and blood contamination on bonding of metal brackets with a 4-META/MMA/TBB resin to etched enamel. Am J Dent 1999;12:299-304. 6. Itoh T, Matsuo N, Fukushima T, Inoue Y, Oniki Y, Matsumoto M, et al. Effect of contamination and etching on enamel bond strength of new light-cured glass ionomer cements. Angle Orthod 1999;69:450-6. 7. Xie J, Powers JM, McGuckin RS. In vitro bond strength of two adhesives to enamel and dentin under normal and contaminated conditions. Dent Mater 1993;9:295-9. 8. Hobson RS, Ledvinka J, Meechan JG. The effect of moisture and blood contamination on bond strength of a new orthodontic bonding material. Am J Orthod Dentofacial Orthop 2001;120:54-7. 9. Bishara SE, Olsen ME, Damon P, Jakobsen JR. Evaluation of a new light-cured orthodontic bonding adhesive. Am J Orthod Dentofacial Orthop 1998;114:80-7. 10. Crane MD, Smart CW, Moon HB, Caputo AA. Effect of moisture contamination on bracket bond strength of hydrophilic bonding materials. J Dent Res 2000;79:548. 11. Swift EJ Jr, Triolo PT Jr. Bond strengths of Scotchbond Multi-Purpose to moist dentin and enamel. Am J Dent 1992;5:318-20. 12. Hara AT, Amaral CM, Pimenta LA, Sinhoreti MA. Shear bond strength of hydrophilic adhesive systems to enamel. Am J Dent 1999;12:181-4. 13. Littlewood SJ, Mitchell L, Greenwood DC, Bubb NL, Wood DJ. Investigation of a hydrophilic primer for orthodontic bonding: An in vitro study. J Orthod 2000;27:181-6. 14. Rix D, Foley TF, Mamandras A. Comparison of bond strength of three adhesives: Composite resin, hybrid GIC, and glass-filled GIC. Am J Orthod Dentofacial Orthop 2001;119:36-42. 15. Grandhi RK, Combe EC, Speidel TM. Shear bond strength of stainless steel orthodontic brackets with a moisture-insensitive primer. Am J Orthod Dentofacial Orthop 2001;119:251-5. 16. Artun J, Bergland S. Clinical trials with crystal growth conditioning as an alternative to acid-etch enamel pretreatment. Am J Orthod 1984;85:333-40. 17. Arvidson K, Johansson EG. Galvanic currents between dental alloys in vitro. Scand J Dent Res 1985;93:467-73. 18. Webster MJ, Nanda RS, Duncanson MG Jr, Khajotia SS, Sinha PK. The effect of saliva on shear bond strengths of hydrophilic bonding systems. Am J Orthod Dentofacial Orthop 2001;119:54-8. 19. Reynolds IR. A review of direct orthodontic bonding. Br J Orthod 1975;2:171-8. 20. Muller AW, Maessen FJ, Davidson CL. Determination of the corrosion rates of six dental NiCrMo alloys in an artificial saliva by chemical analysis of the medium using ICP-AES. Dent Mater 1990;6:63-8. 21. Hitt JC, Feigal RJ. Use of a bonding agent to reduce sealant sensitivity to moisture contamination: An in vitro study. Pediatr Dent 1992;14:41-6. 22. Oesterle LJ, Shellhart WC, Belanger GK. The use of bovine enamel in bonding studies. Am J Orthod Dentofacial Orthop 1998;114:514-9. 23. Schaneveldt S, Foley TF. Bond strength comparison of moisture-insensitive primers. Am J Orthod Dentofacial Orthop 2002;122:267-73. 24. Faltermeier A, Behr M, Rosentritt M, Reicheneder C, Müssig D. An in vitro comparative assessment of different enamel contaminants during bracket bonding. Eur J Orthod 2007;29:559-63. 25. Deprá MB, de Almeida JX, da Cunha Tde M, Lon LF, Retamoso LB, Tanaka OM. Effect of saliva contamination on bond strength with a hydrophilic composite resin. Dental Press J Orthod 2013;18:63-8. 26. Cunha Tde M, Behrens BA, Nascimento D, Retamoso LB, Lon LF, Tanaka O, et al. Blood contamination effect on shear bond strength of an orthodontic hydrophilic resin. J Appl Oral Sci 2012;20:89-93. 27. Santos BM, Pithon MM, Ruellas AC, Sant'Anna EF. Shear bond strength of brackets bonded with hydrophilic and hydrophobic bond systems under contamination. Angle Orthod 2010;80:963-7. 28. Sfondrini MF, Fraticelli D, Gandini P, Scribante A. Shear bond strength of orthodontic brackets and disinclusion buttons: Effect of water and saliva contamination. Biomed Res Int ;2013:180137(ID). 29. Nirupama C, Kavitha S, Jacob J, Balaji K, Srinivasan B, Murugesan R, et al. Comparison of shear bond strength of hydrophilic bonding materials: An in vitro study. J Contemp Dent Pract 2012;13:637-43. 30. Endo T, Ozoe R, Sanpei S, Shinkai K, Katoh Y, Shimooka S., Effects of moisture conditions of dental enamel surface on bond strength of brackets bonded with moisture-insensitive primer adhesive system. Odontology 2008;96:50-4. 31. Zeppieri IL, Chung CH, Mante FK. Effect of saliva on shear bond strength of an orthodontic adhesive used with moisture-insensitive and self-etching primers. Am J Orthod Dentofacial Orthop 2003;124:414-9. 32. Eliades T, Katsavrias E, Eliades G. Moisture-insensitive adhesives: Reactivity with water and bond strength to wet and saliva-contaminated enamel. Eur J Orthod 2002;24:35-42.